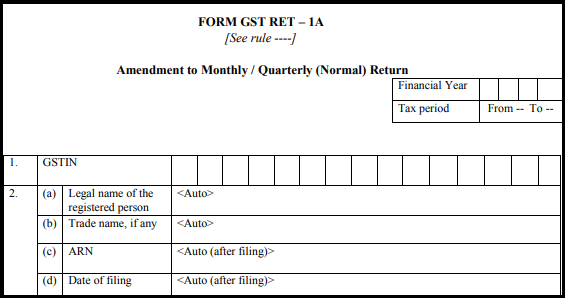 Hello and welcome to this post on the new GST return forms. In this post, we will cover the New GST normal return. 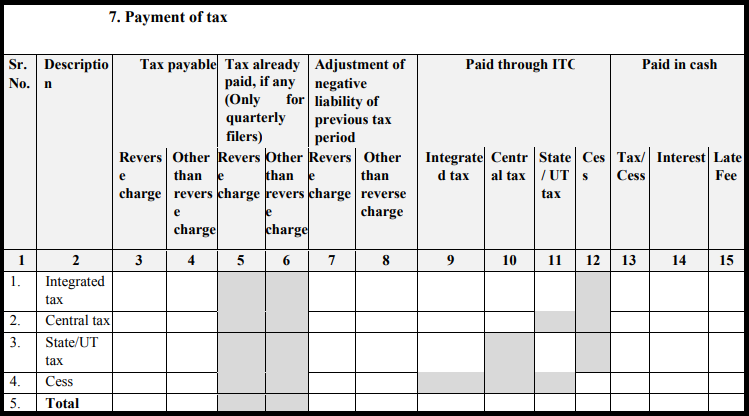 Recently, the GST council offered the normal GST RET-1 (Return) Form with revised details of all the normal taxpayers. It will replace the existing GSTR-1, GSTR-2, and GSTR-3 returns for regular taxpayers who come upto 5 crore turnover. The new forms will be implemented on a pilot basis w.e.f 1st April 2019 and will be made mandatory from 1st July 2019. 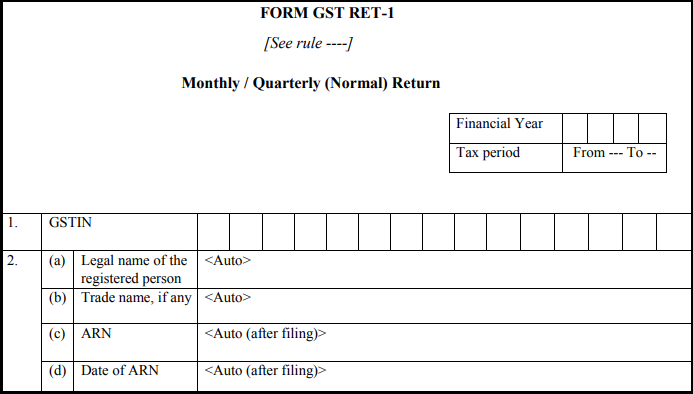 Till then the existing return forms GSTR-1 and GSTR-3B will continue (till June 2019). 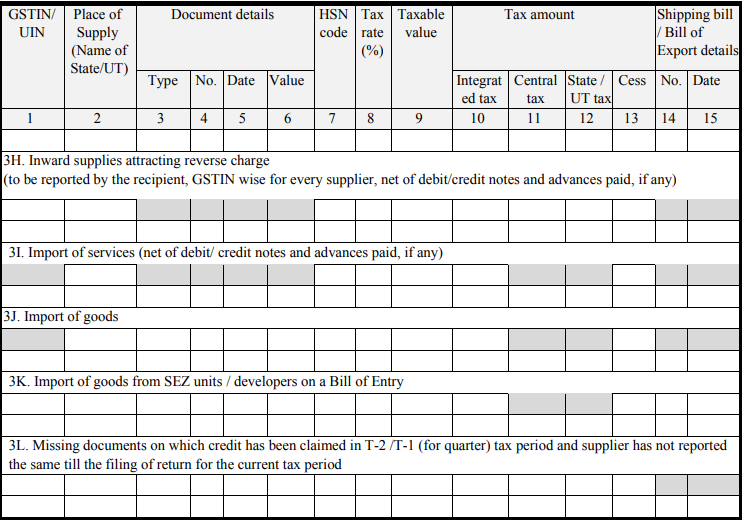 The GST normal form has 7 parts in total. 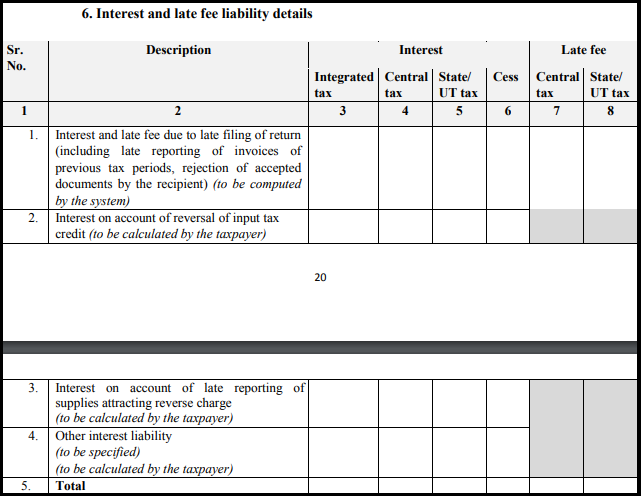 Intimation of option for return periodicity and type of quarterly return. 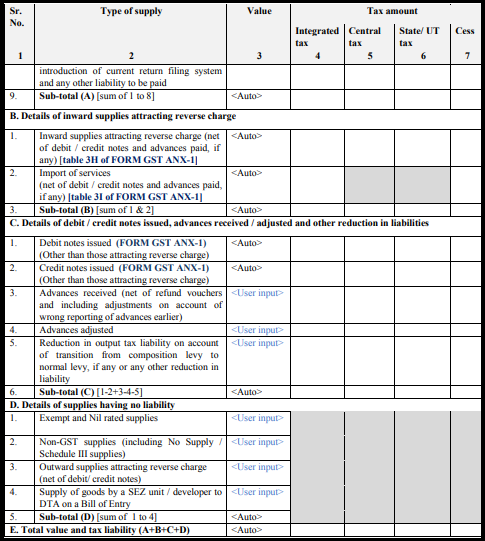 In this section, the user needs to provide answers to a number of questions pertaining to their preferred options for return periodicity (monthly/quarterly) and the type of quarterly return (Sahaj/Sugam/Normal) they wish to file. 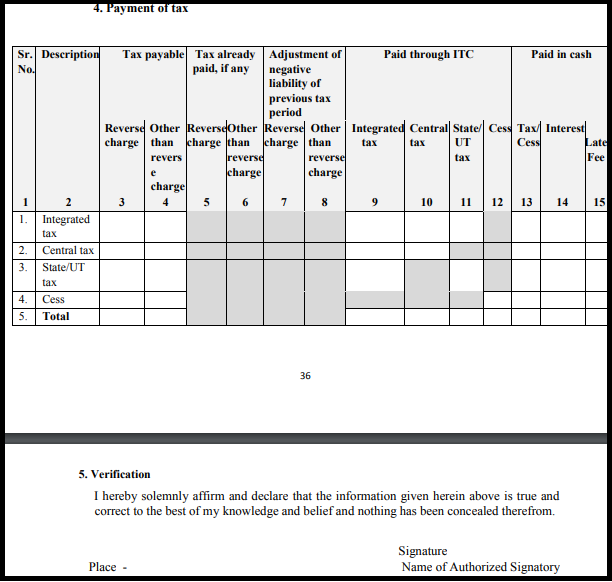 In Part A, you need to answer the questions about retaining the option given in the previous tax period with Yes / No. 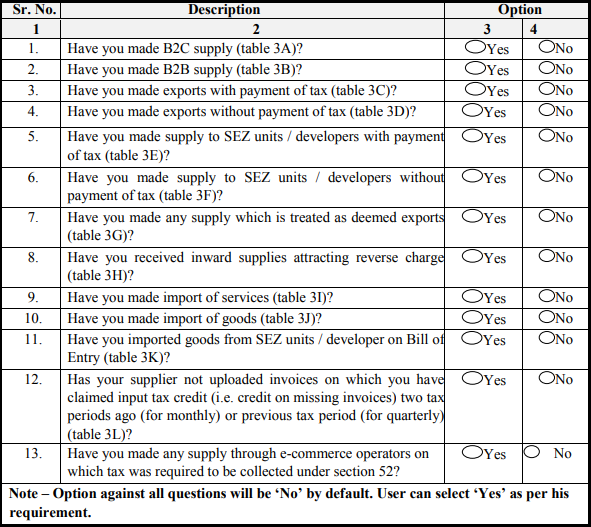 In Part B, questions must be answered about supply type, exports with or without payment, supply to SEZ, import of goods or services etc. 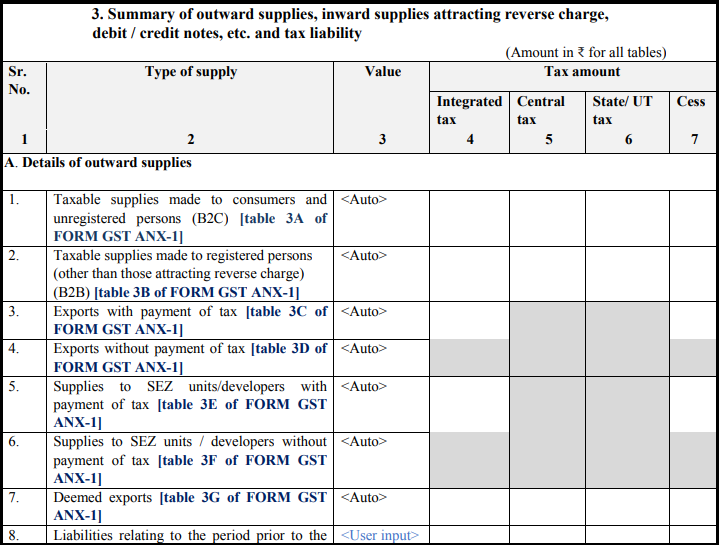 Form GST ANX-1 contains the details of outward supplies, imports, and inward supplies attracting a reverse charge. This form contains 4 parts. 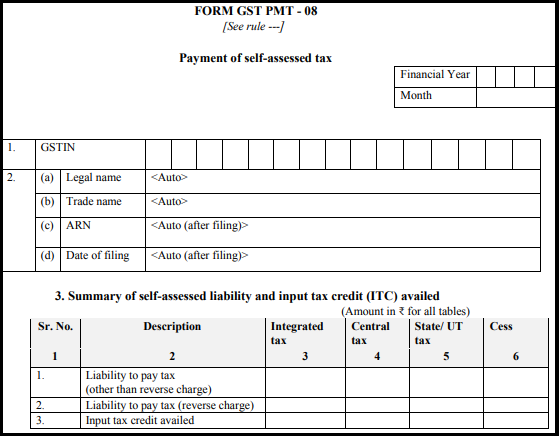 In the first and the second part, you need to provide the GSTIN number, Legal name of the registered person, trade name, ARN and the date of filing. 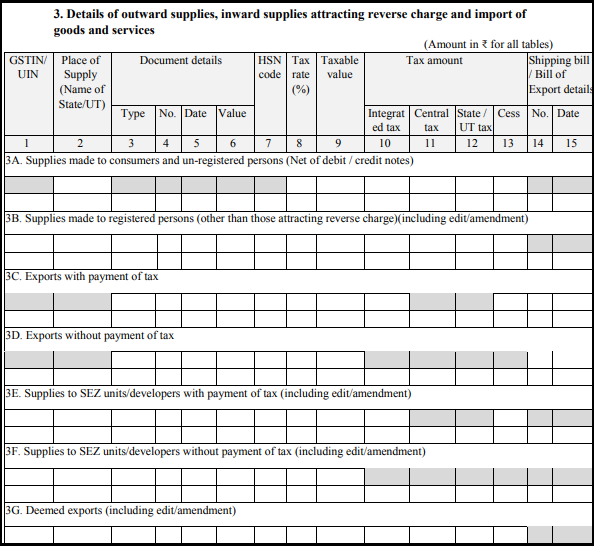 The 3rd part consists of the details of outward and inward supplies attracting reverse charge and import of goods and services. For more detailed view refer to the below picture. 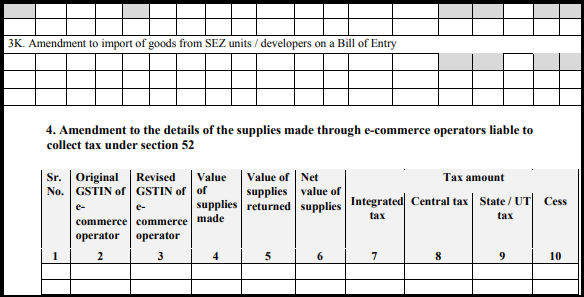 Part 4 consists of the details of supplies made through e-commerce operators liable to collect tax under section 52. There are 5 parts in this form. 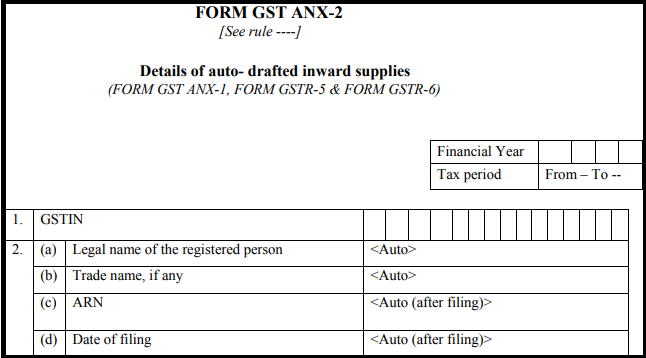 In the first and the second part, you need to provide the GSTIN number, Legal name of the registered person, trade name, ARN and the date of filing, unlike other forms. 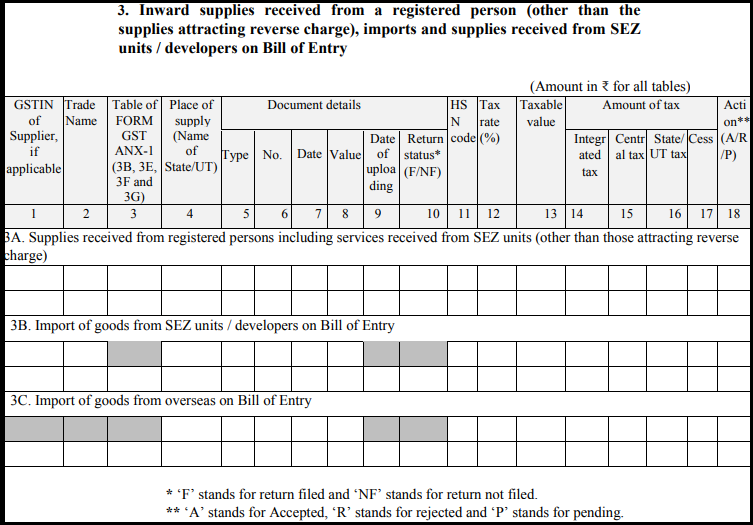 In the third part, you need to provide the Inward supplies details received from a registered person (other than the supplies attracting reverse charge), imports and supplies received from SEZ units/developers on Bill of Entry. 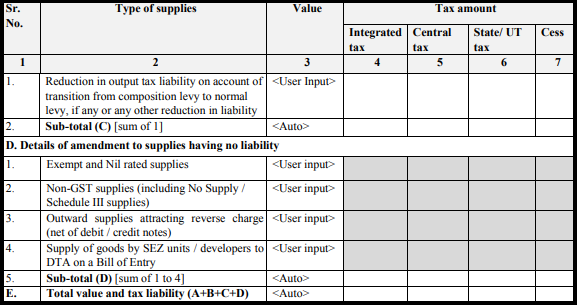 In the fourth section provide the summary of the Input tax credit. This is the Monthly/Quarterly (Normal) return which a taxpayer should file. 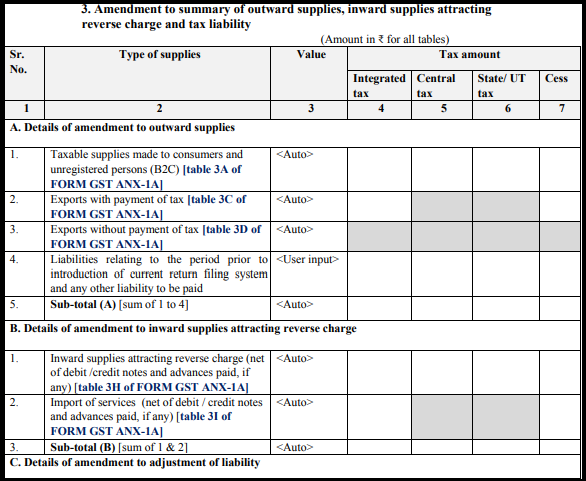 Provide the details of outward supplies, inward supplies attracting a reverse charge, debit/credit notes issued, advanced received, supplies with no liabilities, and total supply value with tax liability will be provided here. 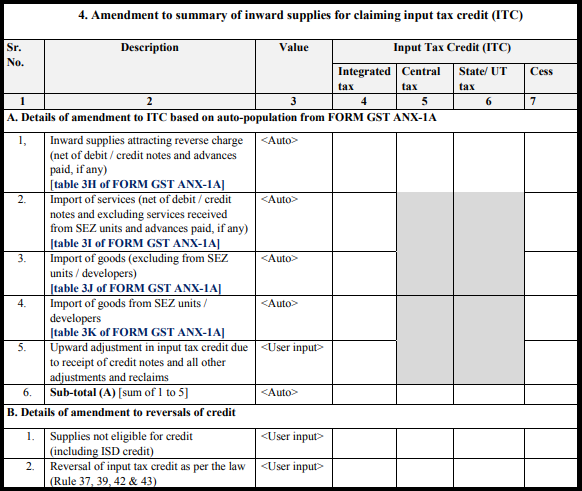 The details of inward supplies for ITC claim. 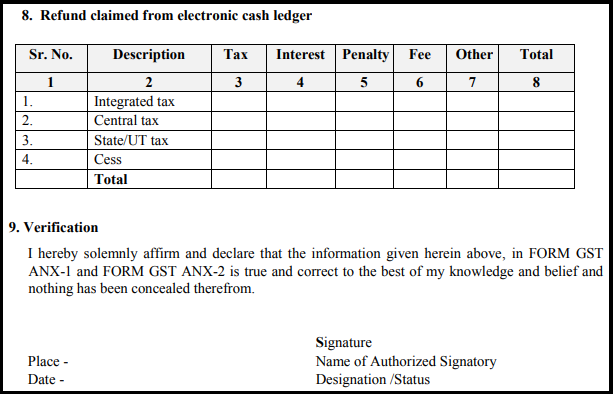 Provide the interest and late fee details in this section. Tax payment, refund claim, etc. will also be furnished through this return form. 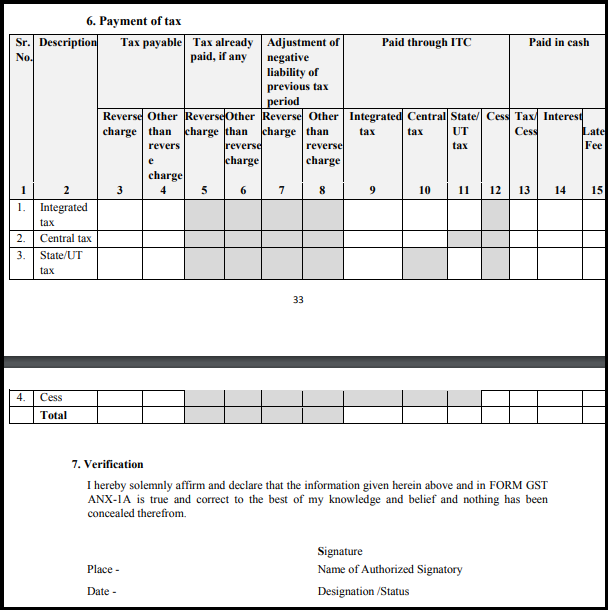 The taxpayer needs to answer a basic questionnaire for filing Form GST ANX-1A. 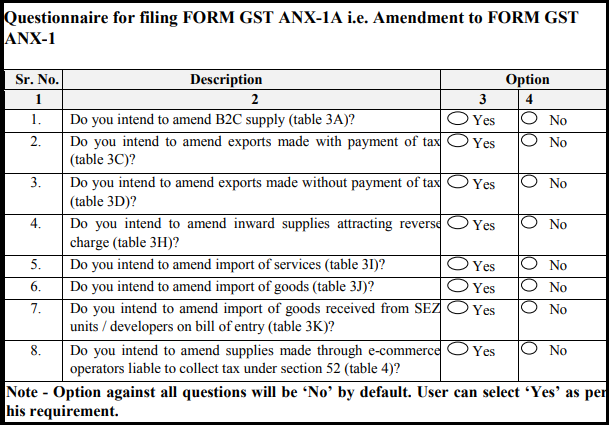 The taxpayer has to file this form for making amendments in the form GST RET-1. 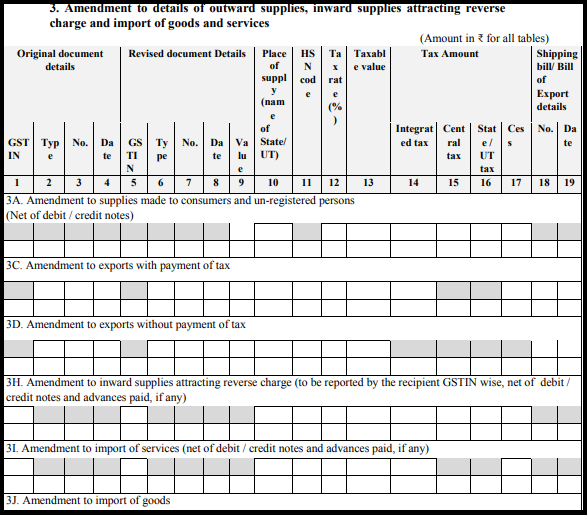 Amendment to the summary of inward supplies for claiming an input tax credit (ITC). Provide interest and late fee details. 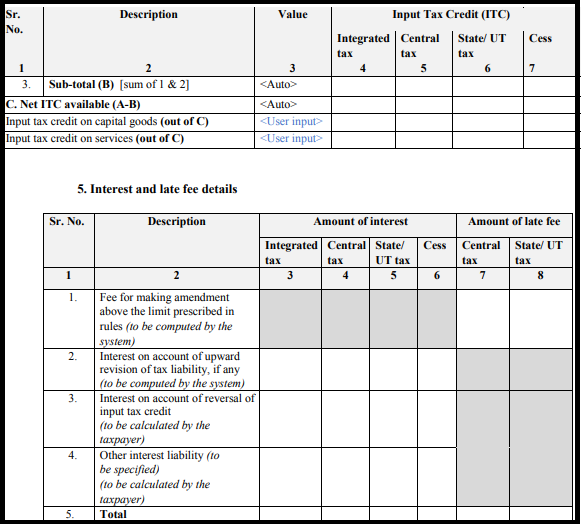 It contains details of Summary of self-assessed liability and input tax credit (ITC) availed and Payment of tax.